Golfers from the University of St. Andrews are visiting Málaga to enjoy ten days of Warm Weather Team Training and to additionally play their first match against UGPM, the college golf team of the University of Málaga. Although it is very common to hear in the North-European countries the sentence among golfers: ”there is no adverse weather for a real golfer, but only poor facilities!”, the reality is in fact, that the winter-months of northern Europe can become really hard even for the most loyal golfers to the aforementioned sports’ philosophy. Hence, many high-level teams opt to take trips to continue their workouts in destinations like ours in Málaga, in which we have privileged and favorable weather conditions all year long. Therefore, we have started the year in welcoming St. Andrews to our UGPM Warm Weather Team Training Program to train a few days, while taking advantage of our favorable climatology. The Program during their stay includes the first university college golf match ever played in Spain between Saints and the golf college team UGPM (The match took place last weekend on the 14th and 15th of January, ending with the victory for St. Andrews). The agenda of the program organized by UGPM also includes the visit to some of the best tours in the region: specifically, today Wednesday January the 18th we are visiting the Royal Golf Club Guadalmina. The Royal Golf Club Guadalmina, has an outstanding reputation and it is known for being one of the best golf courses in Marbella. Guadalmina has hosted important tournaments such as the 1965 Spanish Championship, the European Tour in 1995 and 1996 or the Spanish Championship of APG Professionals In 1998. 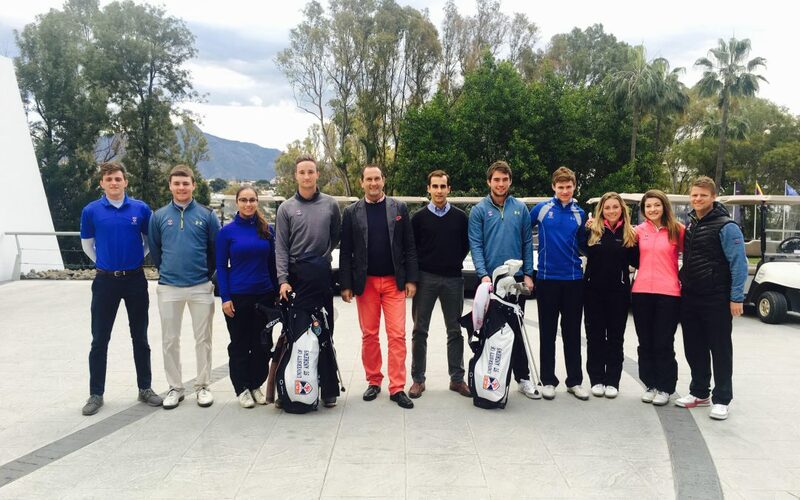 From 2017 onwards, Guadalmina can also boast of having welcomed the University of St. Andrews’ college golf team on his first visit to Spain. The University of St. Andrews, is located in Scotland and was founded in 1413. It is one of the oldest and most prestigious universities in Europe (among its most distinguished students are Prince William, Duke of Cambridge and his wife Catherine Elizabeth Middleton, Duchess of Cambridge). It is also well known that St. Andrews is considered the cradle of golf. It is the birthplace of this passionate sport and it is where the oldest golf club in the world, the Royal & Ancient Golf Club of St. Andrews, was founded. The team at St. Andrews University consists of Cameron Franssen, Peter Kerr, George Burns, Matt Myers, Bjorn Bojesen, Alexa Hammer, Marie Danielsson, Lieve van Veggel and their coach Kevin Hale.